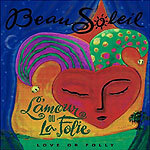 CD review: "L' Amour Ou La Folie"
This review first appeared in the March 21, 1997 issue of the North County Times. After 20 years as one of the premier Cajun bands in the land, BeauSoleil continues to simply rock out. Their newest release has the same spark, the same high energy that the band's fans have always expected. Mixing both traditional folk songs from the Louisiana bayou and new originals (including "Newz Reel," in instrumental used as a TV news theme song for a local station in Lafayette, La. ), BeauSoleil does for Cajun what groups like Fairport Convention and Steeleye Span did for British traditional music: Keep it alive. Listening to BeauSoleil's music makes clear that this is no museum act. Yes, the tunes are much the same as have been heard for generations in Acadia; yes, the instrumentation  accordion, fiddle, banjo, pedal steel guitar  is as traditional as they come. But this music, steeped in tradition, reaches across generations to the everlasting truths of life and speaks to the modern soul with as much power as ny overhyped new folkie or Gen X act on MTV.